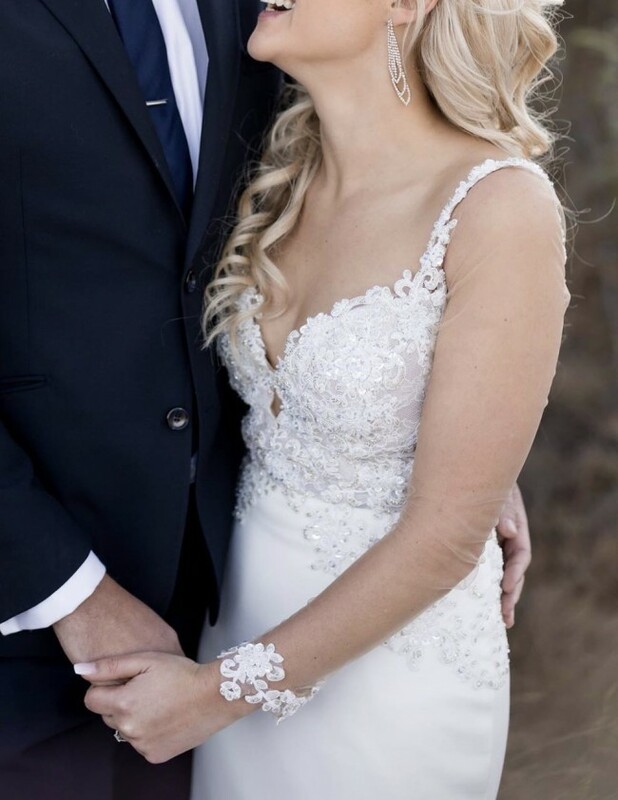 This was my dream wedding dress and I hope that someone else can also find as much joy in wearing this dress as I did :) The dress was only worn once in June 2018 (our wedding day). This is a perfect winter wedding dress as I made alterations to add the sleeves however, the sleeves can easily be removed should you be looking for a summer dress. The dress stole my heart with its beautiful detailed lace, stunning long train and it fits absolutely beautifully due to the elegant crepe material. The dress includes a veil which was made to match the dress's lace and train length. Alterations were made to make the bust area more fitted as well as to add extra lace. Sleeves were added (with lace on the end of the sleeve) however, this can easily be removed should you have a summer wedding. Dress length was also altered to my height incl. high heel wedding shoes (+/-1.64m).